Executive Function (EF) skills form the foundation of success for people of all ages. But individuals with ADHD, Autism, OCD and other conditions have significant EF deficits – failing to thrive at school, work, home and in their most important relationships. Your work with individuals struggling with EF issues is some of your most rewarding -- yet it’s often the work that leaves you the most frustrated and exhausted. Forgotten appointments, unfinished homework, distractibility, procrastination and difficulties organizing thoughts present formidable obstacles to making progress in school or therapy. And the strategies that work so well for other conditions seem to fall short when an EF deficit is present. Get the targeted skills and tools you need to cultivate lasting change and transform the lives of those who struggle with executive deficits - the chronically lost, late and unprepared! 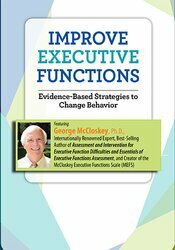 Join George McCloskey, Ph.D., the internationally renowned creator of the McCloskey Executive Functions Scale (MEFS) for this incredible event. An author, researcher, and clinician with more than 20 years of groundbreaking work with Executive Functions, Dr. McCloskey will teach you how to develop customized interventions that can be used with students or clients across multiple settings from the private practice office to the classroom. Practical and easy to apply, Dr. McCloskey’s strategies will help those you serve develop critical time/task management, personal organization, & planning skills, empowering them to elevate their academic and employment performance, relationships, physical & mental health, and more! Whether you’re a counselor, teacher, OT, SLP or social worker you’ll leave this seminar feeling confident in your ability to end the chaos and dramatically improve the lives of those you work with! Analyze a comprehensive neuropsychological model of executive functions as it relates to clinical treatment. Communicate how executive function difficulties are manifested in individuals diagnosed with various psychological disorders and/or enrolled in special education programs as it pertains to assessment and treatment planning. Apply effective assessment techniques based on a multidimensional framework to determine executive function strengths and weaknesses and to target specific intervention needs. Recommend strategies that are appropriate for fostering executive function development and/or for intervening when executive function difficulties are identified. Implement strategies that bridge the gap between “external control” and “internal self-regulation”. Summarize how mindfulness, CBT and other evidence-based programs that foster executive function development and/or remediate difficulties. George McCloskey, Ph.D., is a Professor and Director of School Psychology Research in the Psychology Department of the Philadelphia College of Osteopathic Medicine and holds Diplomate status with the American Academy of Pediatric Neuropsychology. He frequently presents at international, national, regional and state meetings on cognitive and neuropsychological assessment and intervention topics. Dr. McCloskey has amassed over 35 years of experience in test development, teaching research and assessment and intervention work with a wide range of clients. Based on the past 25 years of his research and experience working specifically with children, adolescents and adults exhibiting executive function difficulties, Dr. McCloskey has developed a comprehensive model of executive functions that can be used to assess executive function strengths and difficulties and guide efforts to foster growth and intervene with difficulties. He consults with a number of school districts and private schools nationwide on issues related to improving students’ self-regulation capacities in the classroom, behavior management, assessment and intervention for executive functions difficulties related to academic and behavior problems. Financial: George McCloskey has an employment relationship with the Philadelphia College of Osteopathic Medicine. He receives royalties as an author for Taylor & Francis, Wiley & Sons, and Schoolhouse Press. Dr. McCloskey receives a speaking honorarium from PESI, Inc. Non-financial: George McCloskey has no relevant non-financial relationship to disclose. PESI, Inc. is an AOTA Approved Provider of continuing education. Provider #: 3322. This self-study course qualifies for 6.0 self-study contact hours or .6 CEUs in the Category of Domain of OT and Occupational Therapy Process. The assignment of AOTA CEUs does not imply endorsement of specific course content, products, or clinical procedures by AOTA. Course Level: Intermediate. Expires: 4/2/2021. PESI, Inc. designates this self-study activity for a maximum of 6.0 AMA PRA Category 1 Credit(s)™. This activity was originally recorded on 04/02/2019. It was last reviewed on 10/30/2018 and is valid until 10/30/2021.